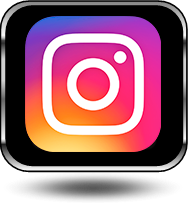 Service Availabilities In Pittsford, Penfield, Webster, Greece, Irondequoit, Rochester & Western New York (NY) Areas Near Me! 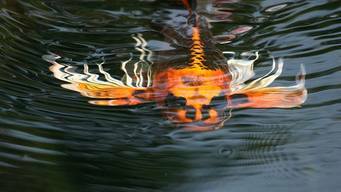 Preparing and cleaning your koi pond properly for the harsh winters in Rochester New York (NY) is crucial for the care, health and survival of your fish which is why we offer fall pond maintenance and pond cleaning services for all of the Rochester, New York (NY) Area. 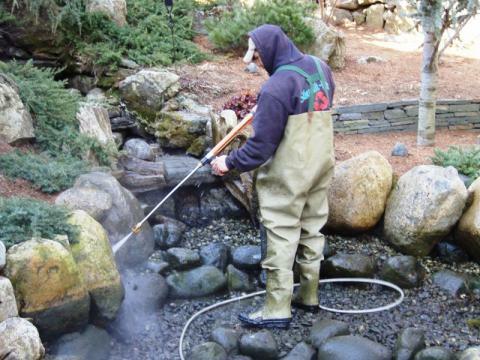 If you decide to shut your pond down for the winter, the process can go fairly smoothly. 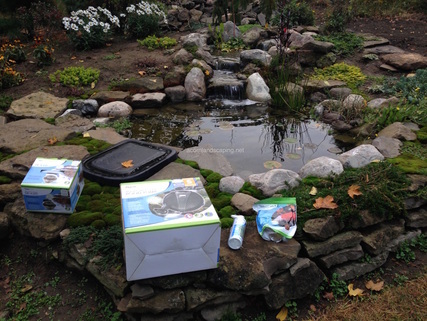 After performing your fall maintenance (making sure all the leaves are out of the pond and the plants have been tended to), make sure the waterfall pump and filter media (replace if necessary) has been cleaned, removed & stored. 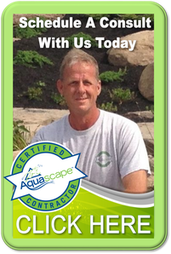 Let The Pros handle your Spring Pond Maintenance Rochester New York (NY)! If you are not going to run your pond during the winter, it is a good idea to disconnect & remove your pump. 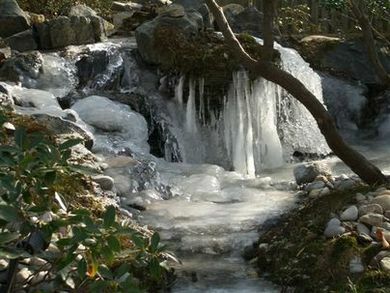 By disconnecting the pump, the water in the line from the skimmer to the waterfalls will drain out and back into the pond, minimizing the chance of the pipe freezing. 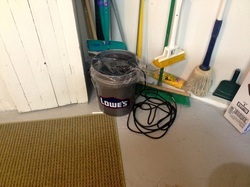 The pump should be stored for the winter in a frost-free location, submerged in a bucket of water. The water around the pump housing will prevent the seals on the pump from drying and cracking. Since most submersible pumps are oil-filled, it is not suggested to let them freeze solid. To extend the life of the pump, it is a good idea to clear the impeller shaft free of any debris before winter storage. 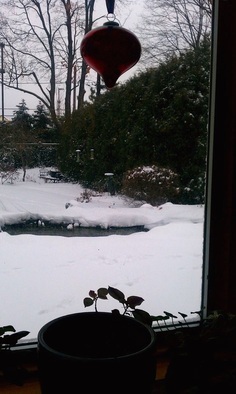 De-icer, bubbler, cold water beneficial bacteria and premium cold water fish food until 55F recommended by Acorn Ponds & Waterfalls for Rochester, NY ponds. In Rochester, Monroe County, New York (NY) the climate can get cold enough to cause your pond to freeze over and you’ll need to be concerned with two things. First, is oxygenating the water. To do this, place a small solid handling pump on the second shelf of your pond so it bubbles right at the surface of the water. 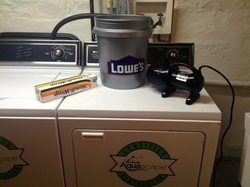 This will replace the oxygenation that your waterfalls were taking care of during the pond season. In all but extremely low temperatures, the bubbling of the pump will also keep a hole open in the ice to allow for gas exchange. This is the second thing that you need to do for your fish. A hole in the ice allows the escape of harmful gasses created by decay of organic matter that would otherwise build up under the ice. Continue to add your cold water beneficial bacteria once a week to maintain clear water & a clean pond. After you start to see ice forming on the surface you can stop your weekly water treatments. If the air temperature stays below 10 Degrees F for extended periods, you'll need to add an Aquascape Pond De-icer in order to keep a hole open in the ice. Controlled by a thermostat, the unit only runs when the water temperature is at or below freezing, heating only the surrounding water to just above freezing, and then shutting off again. A floating heater alone, however, will not oxygenate the water, so it should be used in conjunction with a pump and will be a good backup to keep that opening in the ice should your pump fail in the middle of the winter. Be sure to position them so the two units are not near each other, otherwise the Aquascape Pond De-icer will run continuously in order to heat the water that's constantly being circulated by the pump. Floating heaters/pond de-icers are Highly recommended by Acorn Ponds & Waterfalls in conjunction with a pond bubbler in the Rochester (NY)! One way to keep an opening in the ice and oxygenate the the water is with a pond aerator. 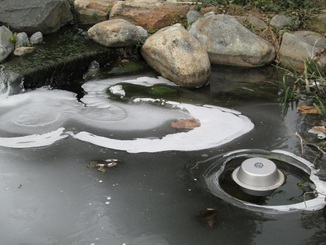 Pond Aerators for backyard fish or koi ponds can be used during the winter months where the bubbles created at the surface help to keep a small hole open in the ice for oxygenation which is important for the health of the fish and cold water bacteria health. The use of solid handling pumps are another means to oxygenate the pond and help keep the opening in the ice. 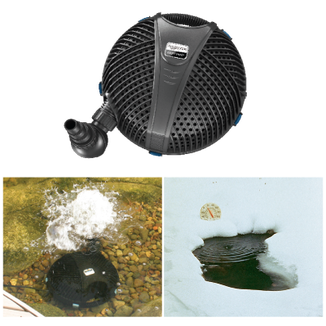 The AquaForce's powerful flow of water positioned just below the surface of the pond will keep a hole open in the ice and ensure critical oxygen levels are maintained in the pond during the cold winter months. The protective cage around the pump will help protect it from leaves that may get in the pond during the winter. Fish are cold blooded animals so as the temperature in the pond begins to drop so does there metabolism. They won’t eat much and we want to stop feeding them when water temperatures reach below 55F. 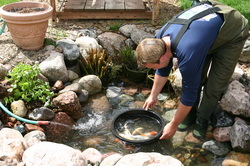 Your pond fish will tend to “huddle” together in the deepest and warmest part of the pond. It almost looks as though they are trying to keep each other warm. They don’t do much, they are almost hibernating, but not a full hibernation. 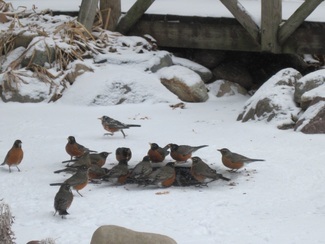 They will begin to move if we have some warmer days. Your pond fish will also not eat. In addition to their metabolism slowing down the immune system also becomes weaker due to the colder temperatures. With their immune system much weaker your pond fish are also much more susceptible to diseases during this time of year. This is why it’s so important to make sure your pond is clean and free of decaying debris such as leaves and aquatic plant die back. A dirty pond will allow many harmful bacteria to grow and harvest in the pond which could ultimately affect the health of your fish during the winter time. Use De-icers in conjunction with solid handling pumps to keep an opening in the ice. Winter is fast approaching in Rochester, New York (NY) and you still aren't sure what to do with your pond. Should you keep the pump running all winter or shut it down? Can you even keep a pond running all winter through freezing temperatures? Maintenance is usually the determining factor in whether or not a pond owner keeps their pump running in the winter. The primary winter pond maintenance responsibility at this time is to make sure there is enough water for the pump(s) to operate properly. Also, if you will be traveling during the winter, it is better to shut down your pond if there won't be anyone to keep an eye on it. There are many benefits to operating your pond and waterfall year-round, but there are also a couple things you need to watch out for. As the water in the falls or stream freezes, the possibility of water loss due to ice damming is increased. When the ice freezes, a dam that pushes the flowing water over the edge of the liner can be created. This isn’t always a problem, but it is something that you need to be aware of and watch out for. You’ll probably be surprised that even during the winter, running water is still exposed to evaporation. Although water loss in your pond is considerably less than during warm months, you will still need to add water to make up for this loss. 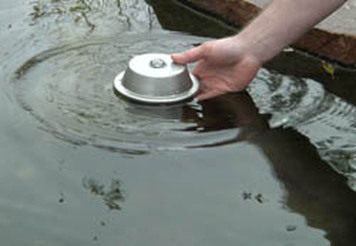 Simply keep an eye on your pond’s water level during the winter months and top off as needed. 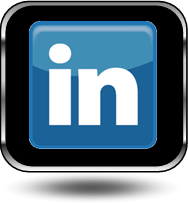 Will The Filters & Pipes Crack? The bottom line for pond winterization in Rochester NY is maintenance. 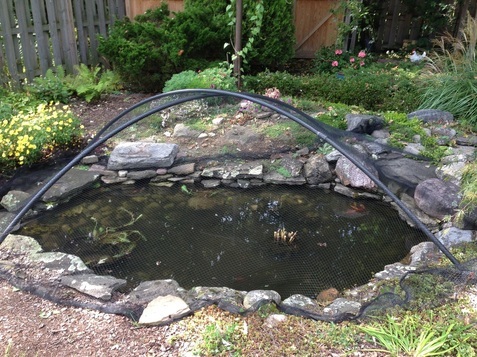 Roughly 70 percent of pond owners in the colder climates decide to shut down their system because they don’t enjoy tending to their water garden during the bitter months of the winter. The aesthetic rewards of the winter pond are absolutely worthwhile, so by all means; don’t be afraid to keep the system running as long as possible. Shutting down a pond during winter is also an option. Just be sure you take precautionary measures to preserve fish, plant, and pump life. PREPARE YOUR FISH FOR WINTER NOW! 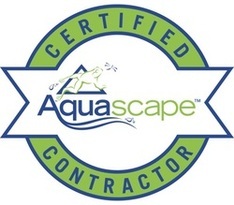 Rochester NY's Most Trusted Pond Maintenance & Service Expert Since 2004.